Finding these letters was a fluke! In the 1970’s I flew from Queensland to attend a General Synod of the Lutheran Church of Australia held in the Barossa Valley. I knew that my great grandfather Peter Zwar’s brother Johann had lived in the Barossa Valley so one morning I called on the current owner of the house and Mrs Roehr made me welcome and showed me the old loft. The floor was covered with inches of thick dust. Buried in the dust I found old letters written in the old German Script. Mrs Roehr was happy for me to have them. The old envelopes showed the letters had been posted from the Appila/ Laura District where I grew up in the Mid North of South Australia. I assumed that my Zwar ancestors had been in regular contact with their Zwar cousins in the Barossa Valley. The reality was that Bertha Becker, a sister of my Becker grandfather, had married Paul Zwar in the Barossa Valley. They were Becker letters written by my mother’s parents and her Becker Uncles and Aunts to their Becker sister who had married Paul Zwar in the Barossa Valley. We owe a special ‘Thank you’ to three people who have translated the letters. Mrs Maria Noske of Hawkesdale in Victoria, Rev Rufus Pech who grew up in the Mid North of South Australia and knew the Becker families, and Mrs Chris Greenthaner who translated some extra Becker letters that came to light! I have deliberately delayed publishing these old letters. The writers would never have dreamed that their letters might some day be published! There are still a few children living (in 2014) whose parents wrote these letters about their families and sometimes shared personal feelings. To most of us these were people we never knew! To others it is about their very own parents. The English Translation by Chris Greenthaner. The Biography of the sick child Rudolph mentioned in this letter can be found in the Becker ‘Biographies’. Pages 1 and 4 of the original letter in the old German Script. Pages 1 and 4 of the first letter. This is the only Becker letter written in English. All the other letters were written in the old German Script. Edel and her brother Richard were still single and living on the farm at Appila with their mother. 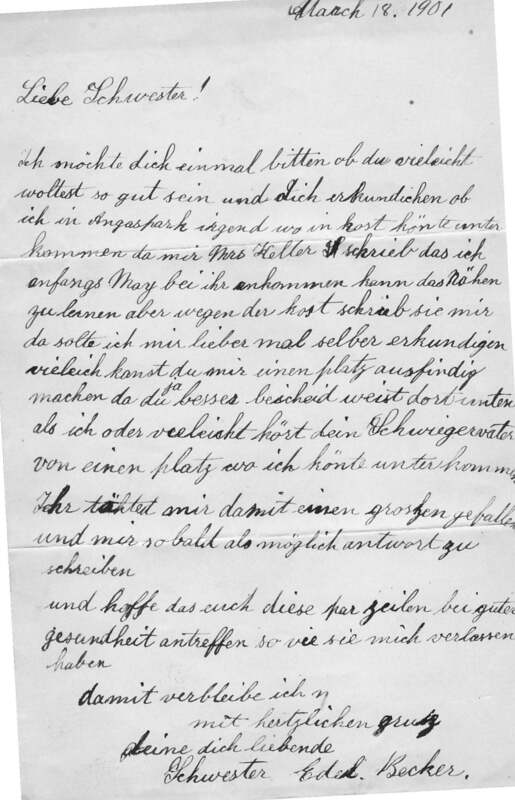 The last page of the original German letter. Mathilde is the wife of Alfred Becker. The English Translation by Rufus Pech. The English translation by Rufus Pech. Due to Lydya’s serious health problems this letter was apparently written in stages from 9th August to its posting on 30th August 1900 – (Rufus Pech). The German original of pages one and four. The English translation by Chris Greenthaner. The name of the writer is not given as the last page is missing. The English Translation by Rufus Pech. The Klemm farm was next door to the Becker farm near Appila. Ida Klemm and Bertha had grown up together and were great friends. G. Jungfer to Paul Zwar. Not strictly a ‘Becker’ letter, but interesting, and Paul was married to Bertha Becker! Copy of the front page of the original Jungfer letter. The English Translation by Rufus Pech. Richard writes about the clearing sale following his father’s death. Richard and his sister Edel were still single and living on the farm at Appila with their mother. The English Translation by Rufus Pech. Lydia and Bertha were Becker sisters. Page 1 of the original German letter. Pages 1 and 4 of the original German letter. The German originals of pages 1 and 4. Please Note: At first the date appears to be ‘1900’. Then it was changed to ‘1901’! The letter mentions the consecration of the new Church coming up soon on July 28th. The new Church was dedicated on 28th July 1901. Richard was still single when he wrote this letter. © The English Translation by Rufus Pech. Two pages of the original letter. Pages 1 and 3 of the original German letter. Page 6 of the original letter. Pages 1 and 4 of the original 6 page letter. The English Translation by Rufus Pech. The envelope is addressed to: Mrs Paul Zwar Ebenezer. P. O. Stockwell. Pages 1 and 4 of the original letter. The envelope is addressed to: Mrs Paul Zwar Ebenezer. P. O. Stockwell. Pages 1 and 2 of the original letter. 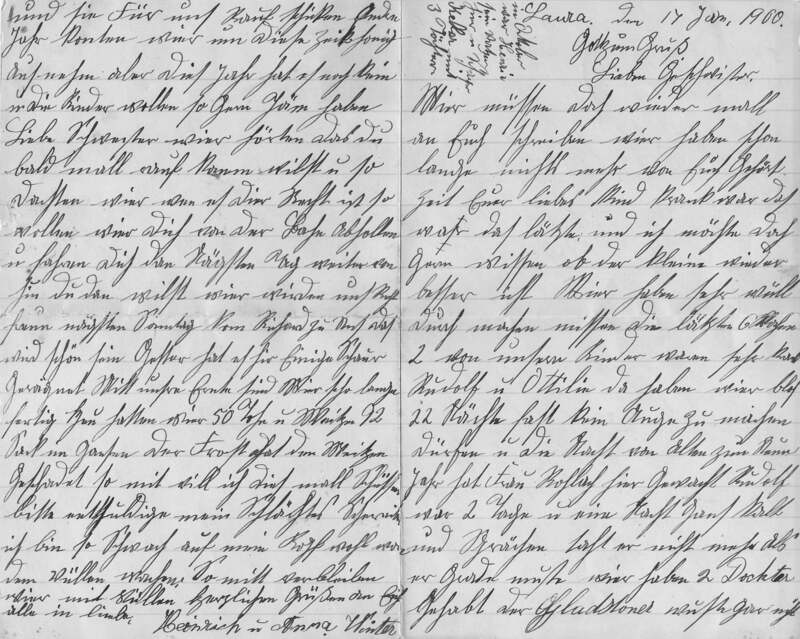 Pages 1 and 4 of the original letter written in German Script. Richard Becker to Paul Zwar 3.1.1904 ? The English translation by Chris Greenthaner. To Bertha and Paul Zwar 22.1.1904 ? First page of the original letter. Pages 1, 4 and 5 of the original 6 page letter. Two pages of the original unsigned 3 page letter. Page one of the original 2 page letter. Pages 1, 4 and 5 of 6 page letter, plus newspaper cutting of the horse sale. Two pages of Sophie’s original letter. Pages 1 and 4 of Edel’s original letter. 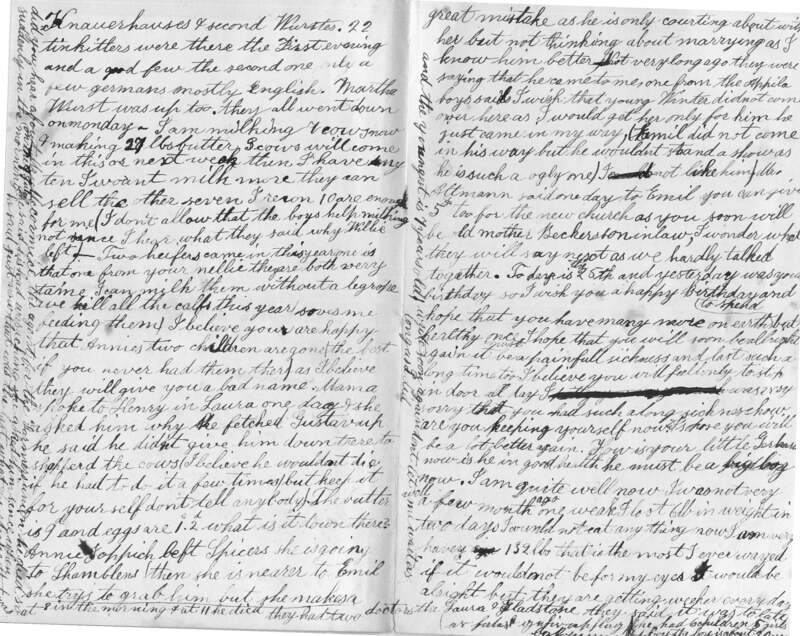 Pages one and 4 of the original letter. Pages 1, 4 and 5 of the original 5 page letter. The last letter we have from Lydia. Pages 1, 4 and 6 of the original letter. born 24th Dec 1905 and died 17th January 1908. The youngest of 6 children. Original Card following soon after death of Gustav’s wife Lydia. Pages 1 and 4 or the original letter.